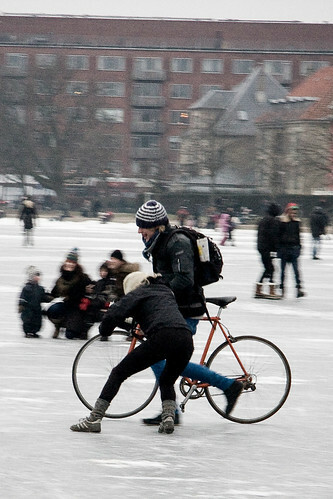 They were crossing The Lakes hand in hand, through the throngs of Copenhageners enjoying the frozen playground. They started running and then sliding. Running and sliding. Laughing the whole way across. And now for a completely new genre... Ice Skate Chic. 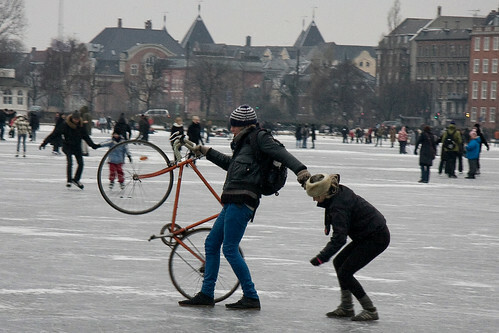 Love these ever so cute bikes, and ice skates. Looks like great fun. I am originally from Chicago. I was reading this article from Treehugger about biking. I thought I would pass it along. Thanks. Nothing beats seeing people laugh so easily. Such fun! If I ever leave this country, I know where I'm headed. You are a walking advertisement for your country! Not only are you an ambassador of cycling in Denmark, you are an ambassador of culture as well. Copenhagen never looked so good. I love the candids of everyday life in your special city. wow, i love the snow! lovely Copenhagen really. If you start a blog for skating chic - sign me up! *Ah! * For the days when ladies wore skirts just to be extraordinary humans doing the most ordinary of things! 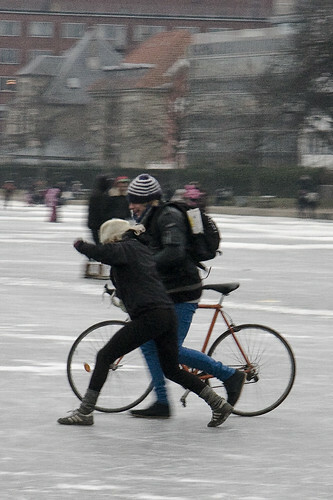 Hooray for skating and biking! I'm in Canada, and it's surprising how difficult it can be to find someone who also likes to combine my two favorite winter activities.